DID you ever see a bird that carried its little ones with its feet? This is what the bird in our picture is doing. The woodcock builds its nest in dry, heathery woods; but it gets its food in marshy, wet places. It goes to hunt its breakfast in the early dawn, before it is very light. 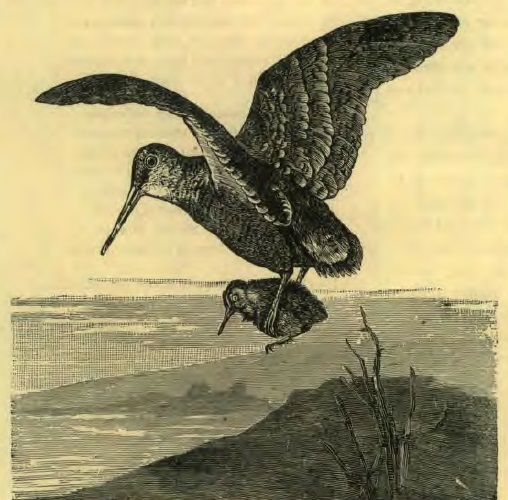 It could not carry food enough from the marshes to its woodland home to keep its little ones alive; so it takes them between its spread feet, as the one in the picture is doing, and carries them to breakfast. It shows great skill in finding worms to eat, thrusting its long bill into the earth up to its nostrils, and never failing to bring up a worm. It is a very silent bird, seldom uttering a cry except when it goes to its feeding place. They fly very high, and are wonderfully swift. They are very hard to shoot, because they have away of dodging and jerking about when they see a sportsman, and so often escape his shot. But it takes only a slight wound to fetch one down, and they never seem to think of running and hiding when once they are wounded. When they change their home, they fly in companies, and like best to make the journey in calm, hazy weather. In color, the woodcock is of several shades of brown. It is about fourteen inches long, and weighs nearly a pound. It builds its nest of fern leaves, laid close together, and it lays four eggs, huffy white, with rusty brown blotches.